Kathleen Kesson’s masterful memoir-manifesto takes the baton from the great thinkers in and on education—including John Dewey, John Holt, Ivan Illich—and races forward. 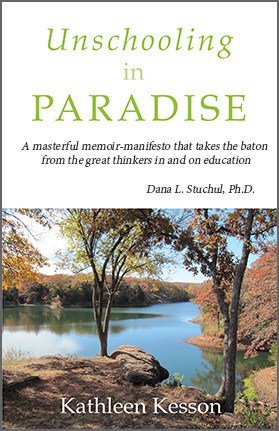 Here, paradise is anything but a formulaic, idyllic White, middle class existence with two parents supporting their “gifted” children in pursuit of their self-defined learning. Rather, Kesson opens her mother’s heart and her brilliant educationist mind to raise the question—sometimes explicitly, at others implicitly—what kind of social organization would be in service to a world made more just, free and sustainable? Answer: Paradise. Where a diversity of learning opportunities exist to replace a “one-best-system fits all” approach where people—and their relationships to their own minds, bodies, emotions, to other humans and to more-than-humans, and to the natural world—are nourished. Leaving no argument for schooling or against home/unschooling unaddressed, Kesson invites all concerned with justice, peace, environmental sustainability, democracy and the well-being of people and their communities everywhere to consider “paradise.” Her masterpiece reads as a “love letter” of sorts, one that could not have come at a more needed time. —Dana L. Stuchul, Ph.D., Associate Professor, Penn State University, co-author of Teaching as if Life Matters: The Promise of a New Education Culture. Kathleen Kesson is a poet—a lyrical, beckoning and righteously angry poet. With provoking (and provoked) questions about the very purpose and consequences of schooling and conversely, education, she insists that we–her readers– enter her text; and then, with her sensuous narratives of fruitarianism, of tarantulas, and of the making of dozens upon dozens of maps, she warmly welcomes us more deeply inside to marvel at the possibilities of unschooled paradise. Her book is set in nomadic paradises assembled of families, geographies of shifting places, spaces of wonder, and of what she terms the “intersecting worlds of art and education and politics.” Kathleen is uncommonly generous in her willingness to so vividly share the magnificent stories of her children learning the world. These stories do not only serve those who are already dedicated to unschooling, but also have the power to disrupt the schooled spaces in which so many children are compelled to spend their days. As a teacher educator, I happily intend to use Kathleen’s vivid accounts of inquiry, messing about, play, and authenticity to prompt my teacher candidates to raise their own provoking – and provoked—questions about what they experience and witness in schools. Because of this and so much more, Unschooling in Paradise is a “very very very fine” book. Kathleen Kesson describes her unorthodox life from hippie homesteader to university professor with verve and insight. Her descriptions about how her children learned through their own curiosity and play will encourage homeschoolers, and her knowledge of education theory and practice will help those who are on the fence about trusting their children’s self-directed learning. Her honesty about the ups and downs of a family living and learning on a shoestring budget in order to live in accordance with their dreams and ethics will resonate with many people. There is a reason why this book is so full of insight. Kathleen combines theory, practice, and deeply lived experience in a way that is exceedingly rare in works on education. She gets to the heart of teaching and learning because for her young people are flesh and blood minds, bodies, and spirits set in the context of their time, not some researcher’s construct. And she tells one mean story along the way. – Chris Mercogliano, author of Making It Up as We Go Along, In Defense of Childhood: Protecting Kids’ Inner Wildness, and other books about children and education. Teaching, learning, and living with creativity, courage and conviction, Dr. Kesson compellingly convinces that every family and community can escape bell curves and other educational instruments designed to dumb us all down in each corner of the global economy. Every page of her book is written to celebrate the fact that genius is as common as dirt — once we begin to walk on our own feet on soil with common sense for regenerating our cultural commons. In this fascinating memoir, Dr. Kesson provides entré into a world that very few modern-day families have experienced, a world of holistic family living where children grow up valued as they are rather than for their ability to submit to the demands of a standardized curriculum. This remarkable family experiment with unschooling illuminates the role of creativity and joy in children’s education, and the depth and breadth of knowledge and experiences available to children in alternative learning contexts. In an engaging and accessible writing style, her narrative contributes to the emerging research literature on unschooling, and invites educators and parents to reshape our vision of both alternative learning and of public schools and what they could accomplish by incorporating a more democratic, trust-based, and playful framework for children’s learning. I have been waiting a good while for Kathleen Kesson to share her experiences with unschooling. Now is a time when we need to hear about viable alternatives in education. It seems each generation struggles to create spaces for rich deep learning. Kathleen, as a professor of education and a mother brings together in these pages a deep wisdom for an integrated and nurturing form of education that is eminently doable. It is only by doing things differently that we can resist the present narrow and stifling approach to education. Read this book, share it with friends and put its insights into practice! With her children all grown up, Kesson looks back and engagingly lets us in and offers us insights into her unschooling journey. In this captivating and informative narrative, she answers many questions that those contemplating or practicing unschooling often have. For instance, she shares why they decided to unschool, what unschooling looks like, as well as offering cautions about mainstream schooling. These insights are of interest to those new to unschooling as well as academics that might be researching many of the issues around unschooling. I encourage all those interested in unschooling to read this rich and helpful book. Carlo Ricci, Ph.D., Professor, Schulich School of Education, Nipissing University, author of The Willed Curriculum, Unschooling, and Self-Direction: What Do Love, Trust, Respect, Care, and Compassion Have To Do With Learning? and founding editor, Journal of Unschooling and Alternative Learning. I have known and admired Kathleen Kesson’s work since I published an outstanding article of hers twenty years ago. Her thinking and writing create useful bridges between leading edge educational scholarship and the practical concerns of teachers and parents. This manuscript is among her best work; writing for a more popular audience, she is free to unleash her delightful sense of humor and sensitive insight into young people’s experiences. Having worked with, and written for, homeschooling families, I am confident that Unschooling in Paradise will appeal to a large audience. I also think it is a vitally important book for helping the general public understand the possibilities of education beyond mass schooling.